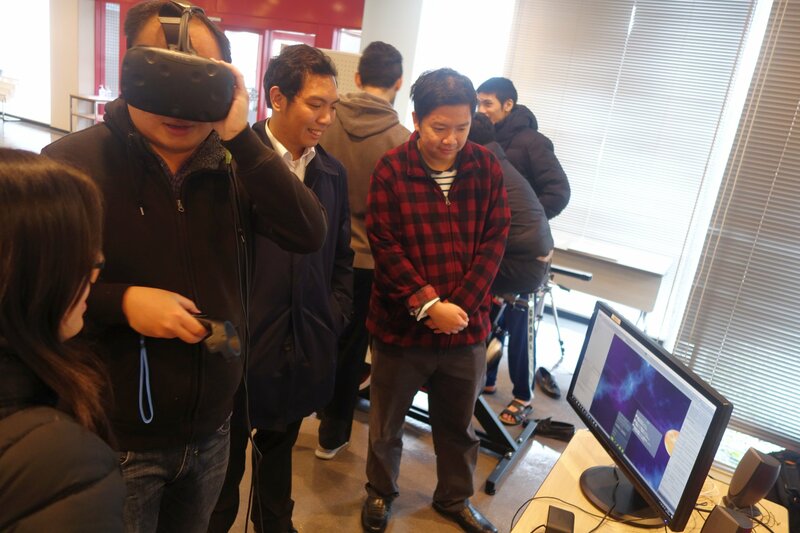 Students participating in the Creative and International Competitiveness Project (CICP) presented their finished projects during the Spring Seminar and the Open Campus of February 24 and 25. 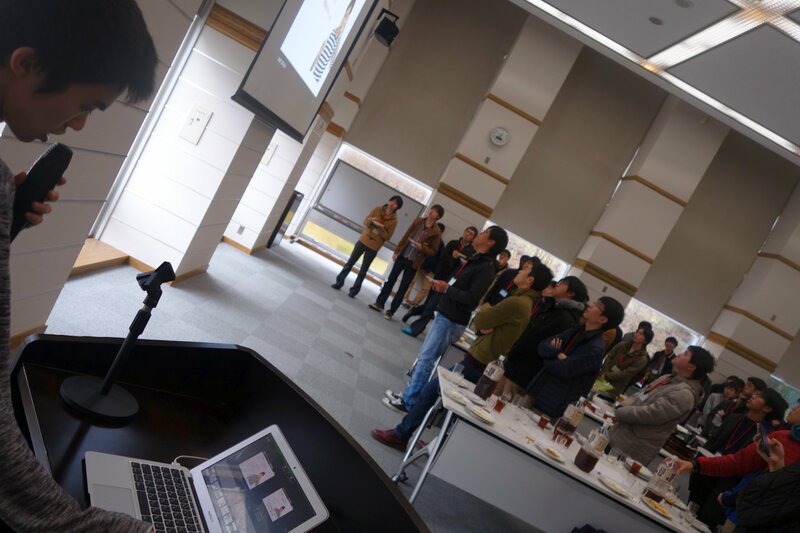 The CICP is a yearly competition held in the Graduate School of Information Science of NAIST. Students could apply with a project in June to receive research funds, and started work in July. Team leaders had to manage their own research budget and organize their teams. The 16 teams presented their progress at the CICP Workshop in early December, and the final results of their work at the Spring Seminar and Open Campus on February 24 and 25. CICP teams give 1-minute lightning presentations to the participants of the Spring Seminar. Team Solar Voyager demoing a speech recognition system to be used in educational VR applications. This year, 16 projects participated in the CICP, including the project Knockout Knee Pain, a research initiative offering live feedback on cyclists’ leg posture, a project on Dog Emotion Estimation and another proposing an intelligent seasoning container. 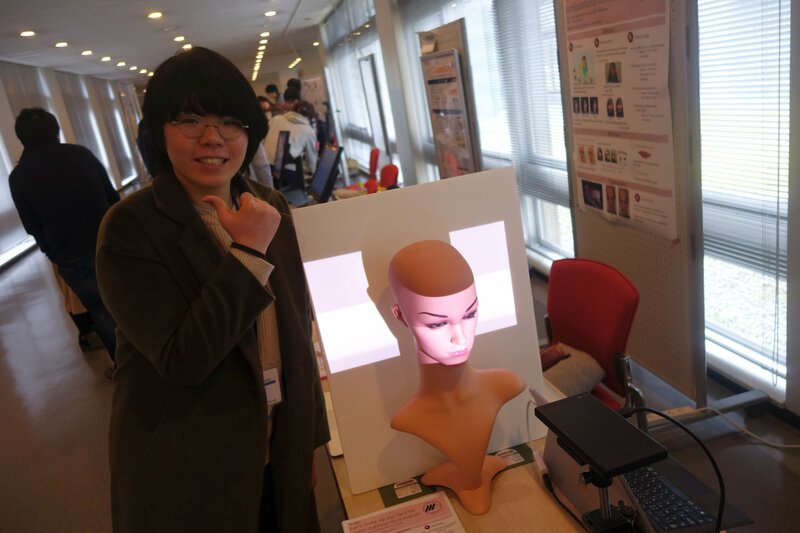 Team ZZZZ used facial feature detection to project makeup onto a human face. 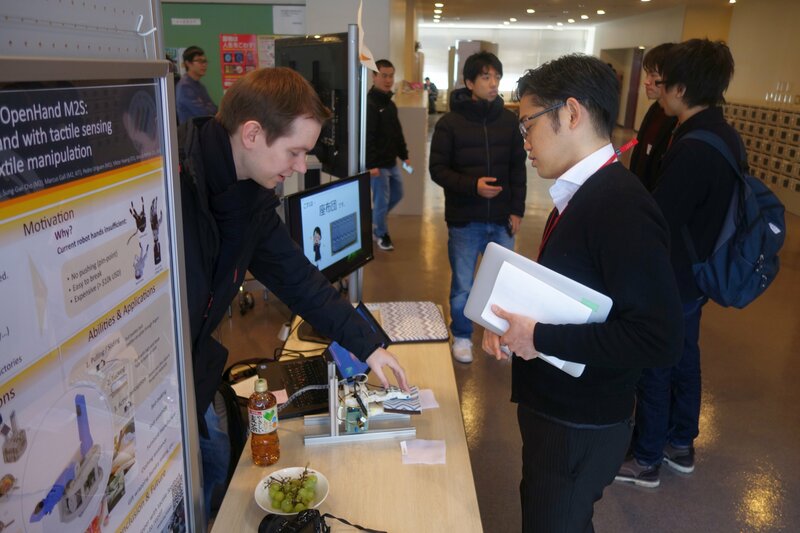 Team NAIST OpenHand M2S demoing the material recognition capabilities of their hand. Team YYYY detected metal objects caught in a wireless charging station. During both Open Campus and the Spring Seminar, members of the audience were given 2 stickers (worth 2 and 1 points each) to vote for the projects they found the most convincing. Projects could also score points by publishing their work at exhibitions and conferences (5 pts), winning awards (10 pts), and being featured in articles (15 pts) or TV broadcasts (20 pts). The projects with the most scores received awards at the ceremony that followed. 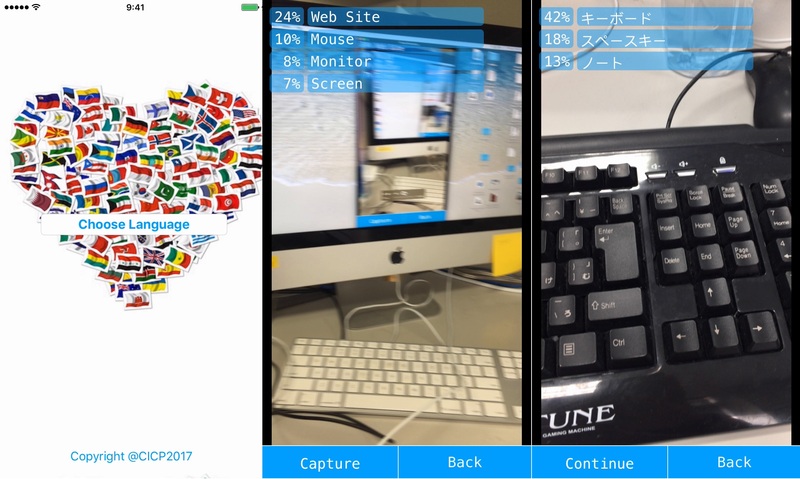 The “Special Research Project Award” went to the project InstantLearn, who implemented a language learning application that uses computer vision to provide translations of real-world objects rather than text. CICP 2016 Special Research Project Award: InstantLearn. 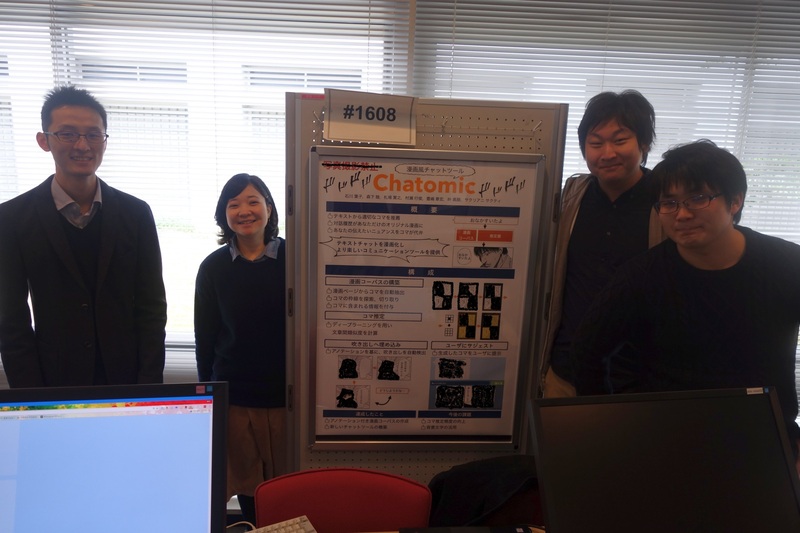 The “Excellent Research Project Award” was claimed by the team of Chatomic, a team staffed mainly by students of the Augmented Human Communications Laboratory, who used Optical Character Recognition (OCR) and speech recognition tools to make a chat client which proposes manga panels resembling the tone and content of a text message. The users then choose the panel that matches their intended tone, and thus create a more expressive conversation. They presented a live demo on tablets to the great amusement of children and adult children. CICP 2016 Excellent Research Project Award: Chatomic. 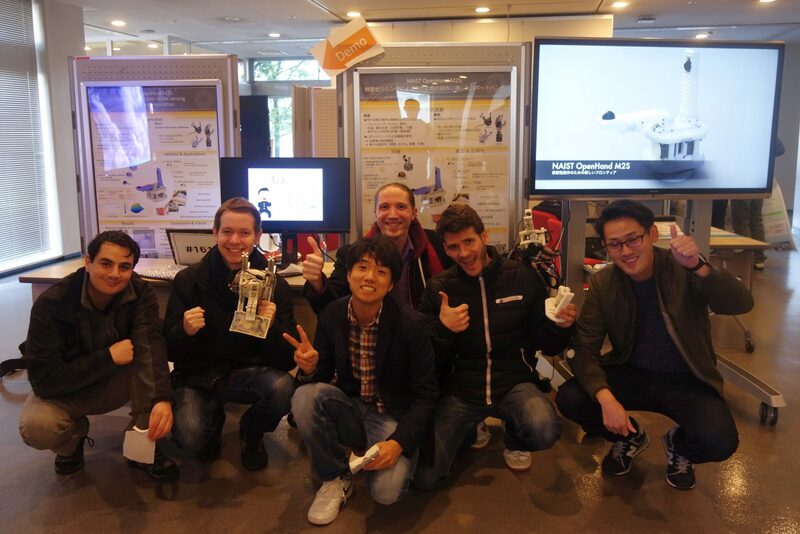 The “Best Research Project Award” went to the project NAIST OpenHand M2S: A robotic hand with tactile sensing for textile manipulation, by a team from the Robotics Laboratory who took the lead with multiple publications, blog articles and a TV appearance. 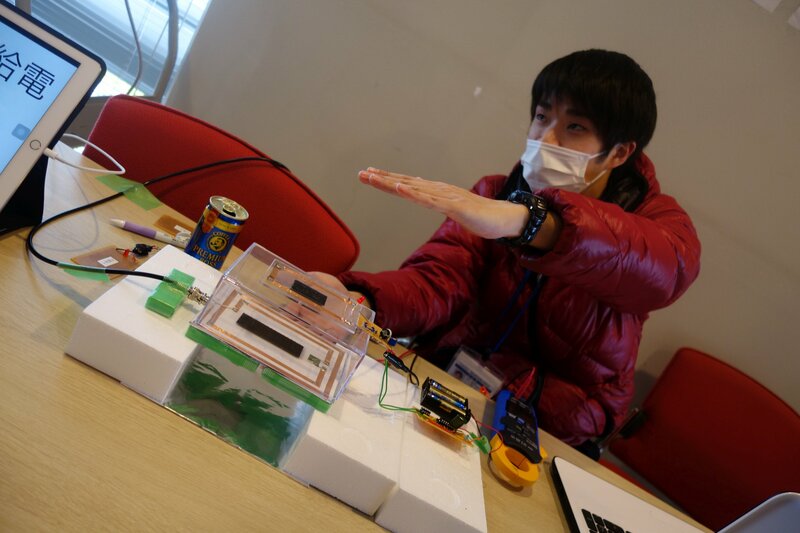 Their project combined sensitive grasping with pin-point pushing capabilities in an open-source 3D printable hand. The prize was a research budget extension of 100,000 JPY. CICP 2016 Best Research Project Award: NAIST OpenHand M2S. Every student of the Graduate School of Information Science can apply and compete with their own project. Maybe you will win the prize next year?